A home that blends great design with quality materials and furniture may almost be unheard of in a modern day but that doesn't mean that it's not possible. This stunning and blissful home located in Portugal, perfectly blends designer elements and excellent lighting to create a tranquil environment… one where the outdoors may be appreciated. 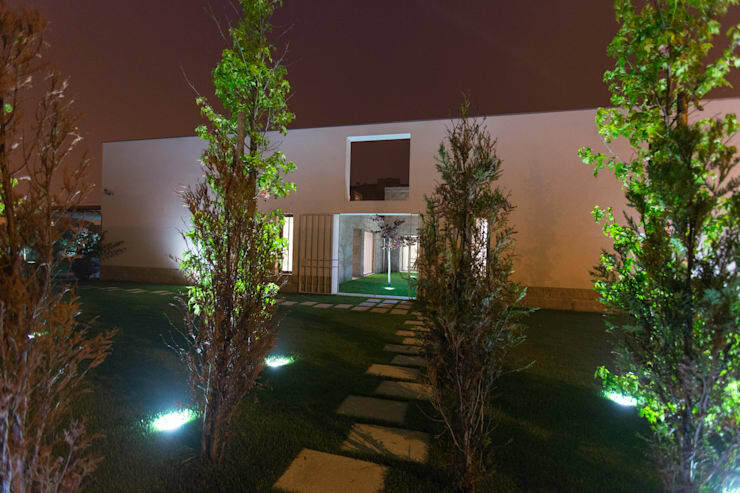 The villa was designed by the team at RDLM Studio, based in Espinho, and has style of necessity and simplicity integrated into every aspect, from the exterior to the interior of the home. Each room has been well planned and executed to create a comfortable home filled with natural light that creates a cosy atmosphere. Continue reading this homify 360 feature for a closer look at this elegant home! Our first glimpse into this blissful home shows us the intimately lit porch with its dusky setting and well constructed design, it is excellently surrounded by great grassy grounds creating an appreciation of the outdoors. This area is sure to be a social space, an extension of the home if you will. Imagine all the parties, events and family occasions that can be enjoyed here! Keep your indoors clean, while enjoying that family fun day outside on the deck! The stone wall exterior adds a rustic edge to this modern home, while the lighting on the porch itself is perfect for evening occasions. This image of the exterior provides an alternative view… an almost mystical angle. The contrasts and shadows created by the trees and artificial lights throughout the outdoor space make it almost eerie. Just think about how great this space will be during Halloween? It's effortlessly unusual and mysterious, but still so fantastic! The footpath leading the way into the courtyard has a country charm, but at least this way your grass stays perfect! Now we venture inside the home to wander through the rooms of the interior. The stunning stone wall creates a touch of elegance and rustic design in this well-lit hallway, while the addition of the grey rug and antique wooden sideboards add that extra atmosphere of vintage charm. Have you seen that ceiling, though? 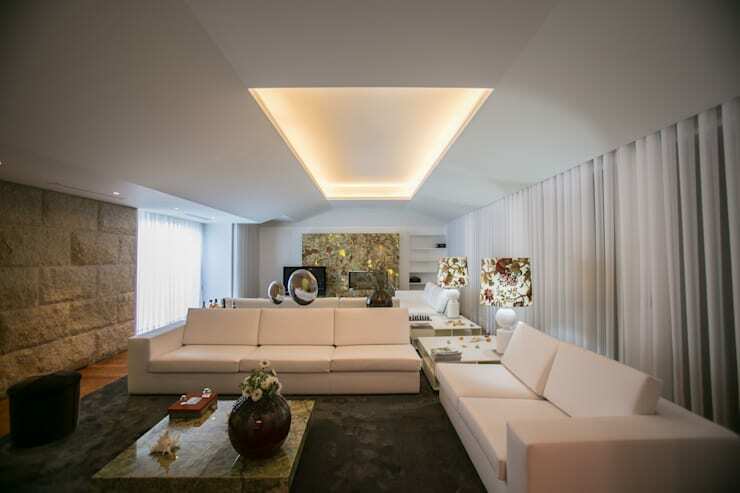 Talk about creating a stylish interior with dazzling illumination through skylights! This hallway shows off its crisp and neutral tone through the use of all-white walls and natural wooden flooring. The design elements coupled with the high ceiling makes this area open with the addition of natural sunlight through the skylight. 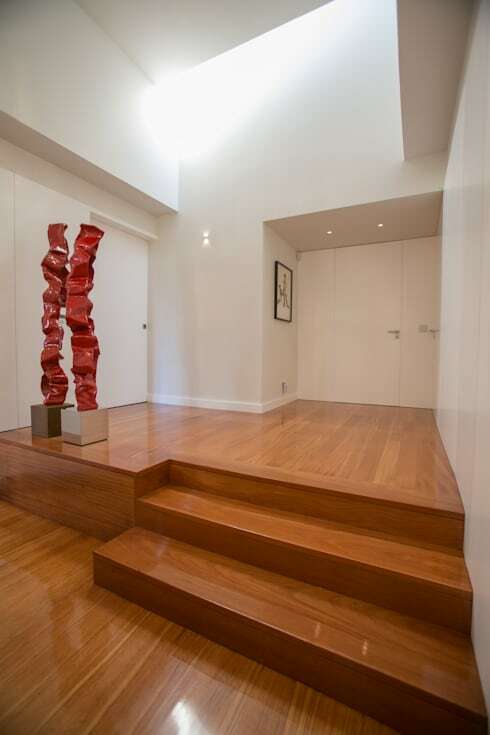 The simple design is elegant and will remain trendy for many years, while the addition of an art piece here almost creates that art gallery design, where platforms and high ceilings with minimal colours as décor makes the perfect neutral space for abstract appreciation. The elegant living room has a modern design, the use of clean lines and exquisite furniture has created a comfortable space for those days of peace. 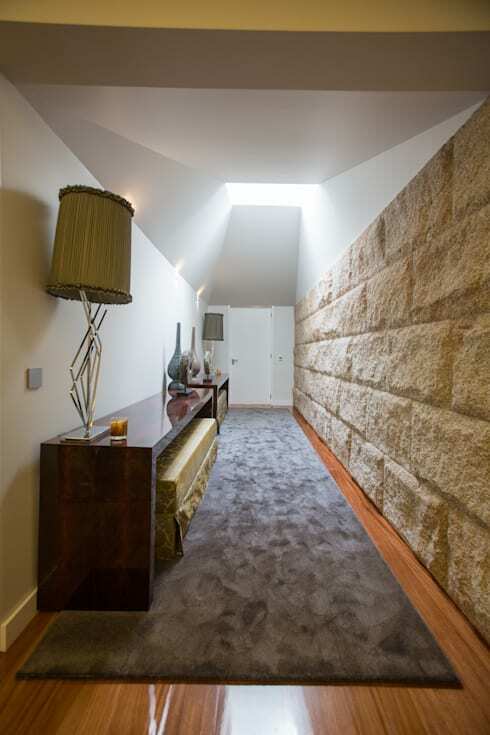 But we continue to see that same decorative element displayed here, the stone wall and wooden flooring as well as comfortable rug complement the space perfectly. To emphasise the relaxing atmosphere of this living room we see an inclusion of large white sofas, and creating an even brighter yet cosy interior is the addition of a central light in the ceiling, adding illumination while warming the space too. It's a win-win situation! Each and every aspect of this home has made excellent use of the generous space, but the kitchen is by far the most stunning. The all-white cabinets and minimalist design, complete with excellent choice of appliances and lighting make this kitchen a dream come true! 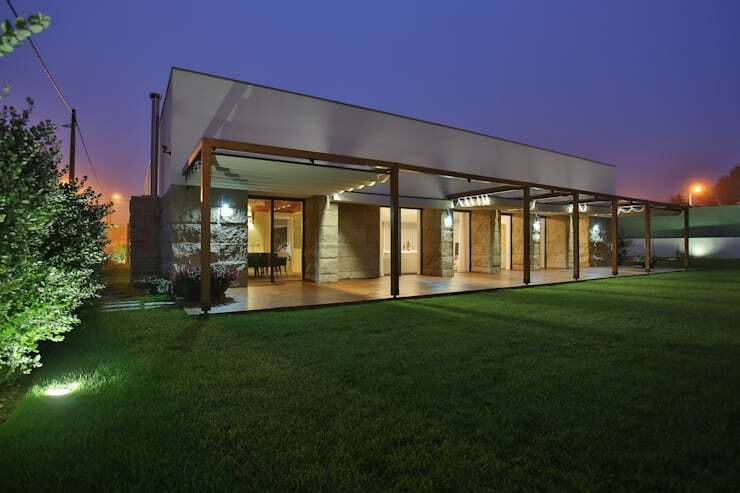 This home has taken the use of skylights throughout the rooms to the next level, making this home naturally well-lit throughout the day, while the addition of beautiful lighting elements adds a brilliance at night! For more inspiration, take a longing look at: The Functional And Modern Kitchen Of Your Dreams. Which room would be your favourite in this home? 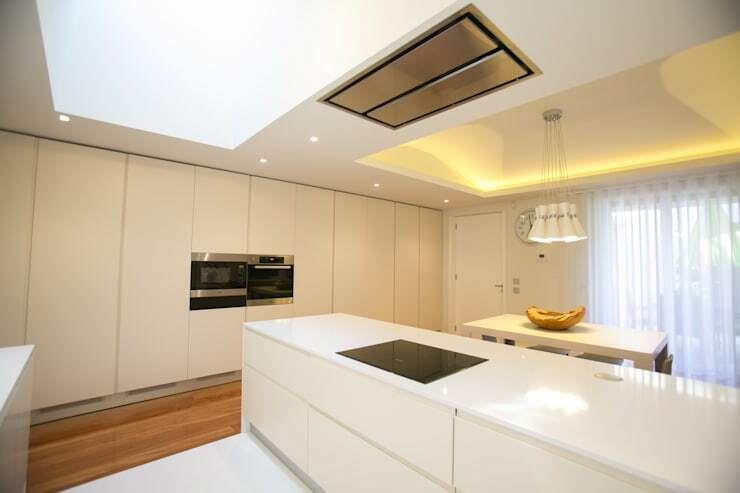 What do you think about skylights? Share your thoughts with us!